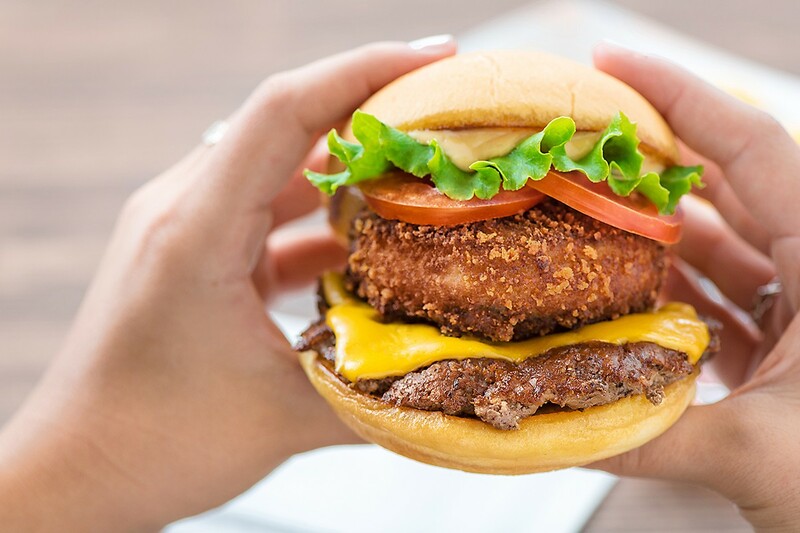 Shake Shack's "The Stack" burger with two beef patties, cheese, veggies and a fried portobello mushroom. Photo courtesy of Shake Shack. As has become tradition for the national chain, it’s customizing the shop’s offerings by sourcing some ingredients from independent Houston businesses. First off are the frozen custard concretes: Pie Oh My, vanilla custard with a slice of seasonal pie from Rebecca Masson’s Fluff Bake Bar blended in and West U‑nicorn, vanilla custard that incorporates Unicorn Bait cookies, also from Fluff Bake Bar, as well as strawberry puree and salted caramel sauce. As is fitting for something made with products by Masson, who regularly supports dog adoption groups, five percent of sales from the Pie Oh My concrete goes to the Houston Humane Society. 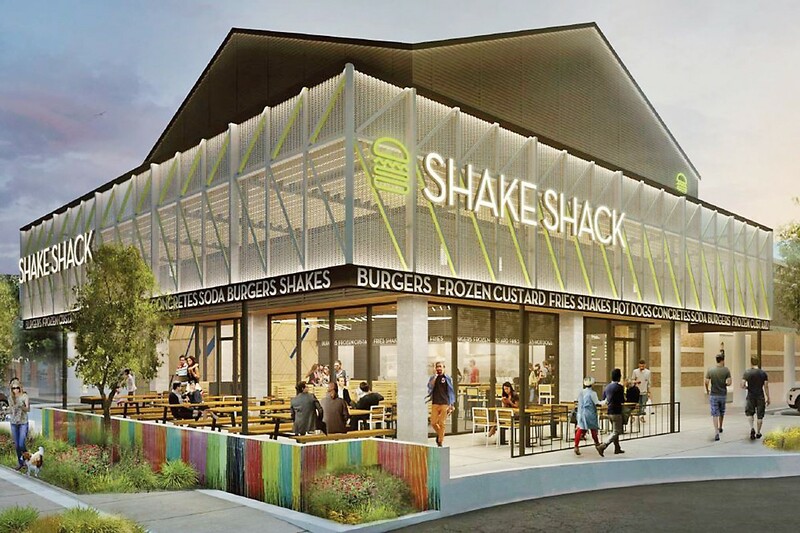 A rendering of the new Shake Shack in Rice Village. Rendering courtesy of Shake Shack. While Shake Shack’s proprietary ShackMeister ale is available as usual (an easy-drinker made by the very capable Brooklyn Brewery in), more local flair comes by way of the other beer taps. Those will pour offerings from Houston breweries Saint Arnold Brewing Company, Back Pew Brewing and Anheuser-BuschInBev-owned Karbach. The restaurant is also offering Texas-made Shiner beers. Wine lovers weren’t forgotten—Charles and Charles Cabernet and Pacific Standard Sauvignon Blanc are also available. Shake Shack standardly incorporates reclaimed materials in each shop design. For the Rice Village location, table surfaces made by CounterEvolution in New York City use wood from reclaimed bowling alley lanes, the chairs by Uhuru in Brooklyn use sustainable materials and booths crafted by Staach in Rochester use lumber certified by the Forest Stewardship Council. Visitors who go to the new Rice Village location when it opens should brace for one likely possibility: long lines. Shake Shack’s hours are from 11 a.m. to 10 p.m. Sundays through Thursdays and 11 a.m. to 11 p.m. on Fridays and Saturdays.